The 7th session of the Eleventh Manipur Legislative Assembly began today with the Governor’s Address. Governor Dr. Najma Heptulla in her address to the first session of 2019 highlighted achievements and developments of the State administration. Governor said that Government strongly believed in this principle in letter and spirit and doing our best to bring communal harmony with inclusive development to bridge the emotional and developmental gaps between hill and valley area without any discrimination and with the active participation of various communities of the state. Towards achieving this, the Government has launched “Go to Village” programme in a mission mode under which every census village in the State has been covered successfully reaching out to the people. A “State Level Empowered Committee” was constituted to review and facilitate timely approvals, clearances, implementation and completion of mega projects and flagship programmes within a stipulated time frame. Government has also established an “Investment Facilitation Centre” to enable single window project clearance process for promoting investment in the state. The governor speech elaborated about the improvement of the law and order conditions. “State Human Rights Commission which was non-functional for nearly 9 (nine) long years has been re-established and made functional. The government has strengthened the office of public prosecutor by recruiting 7 (seven) more Assistant Public Prosecutors to ensure timely disposal of pending cases. The government has always kept its doors open for negotiations with any insurgent group in order to bring total normalcy in the state. Securing the highways in the State has been the priority of my Government. Government of India has sanctioned 2 (two) India Reserve Battalions for Manipur state, for which recruitment process has already started”, she said. Pertaining to Finance and Planning the Government is committed to enhancing State’s own resources and ensuring fiscal consolidation so that public investments and growth are not undermined. Implementation of Goods and Services Tax has improved tax collection with increased compliance by taxpayers. She informed the august House that recently Manipur was awarded by the Government of India as the best performing State in e-procurement implementation in the North-East. Under Non-Lapsable Central Pool of Resources, the state secured an assistance of Rs 79.15 crore this year for 8 new projects and 10 ongoing projects. The allocation of funds under North-East Special Infrastructure Development Scheme is increased to Rs 194.95 crores. The Government is successful in getting approval for a new scheme called “Hill Area Development Programme” this year, with an outlay of Rs. 90 crore from Ministry of DoNER, for infrastructure development of Tamenglong and Noney Districts.With the support of Ministry of DoNER, 4 projects costing Rs. 69.92 crore under Social and Infrastructure Development Fund have been taken up in the remote hill areas for infrastructure development in Communication and Water Supply sectors. She further said that “Manipur Start-up scheme” is one of the most ambitious employment generation schemes conceived and launched by the State Government. Its objective is to create a vibrant start-up ecosystem to nurture innovation, encourage entrepreneurship and to create employment opportunities. Under Manipur Startup Scheme - Round 1, 334 startup under different categories have benefitted through disbursement of loan and subsidy component. Four BJP Imphal Municipal Corporators and three ex candidates of other parties, two ADC members and nine social workers have newly joined into the Indian National Congress today. In a reception function of the newly joined members which was organised by Manipur Pradesh Congress Committee held at Congress Bhawan B.T road Imphal, Ex MLA O. Joy said that the BJP led government has made India into panic stricken and a state of turmoil. He added that the government led by PM Narendra Modi has made India into a dictatorial government silencing every voice which is against the government leading to a Hitler like government. He concluded that if the people want to save Manipur and India and to safeguard secularism, Constitution and democracy of India then BJP needs to be wipe out from India. The reception function was attended by CLP Leader O. Ibobi Singh, President of Manipur Pradesh Congress Committee Gaikhangam and Former President of Manipur Pradesh Congress Committee as the Chief Guest, President and Guest of Honours of the function respectively. Putting pressure to discuss the issue of the employees of Imphal Municipal Corporation over their demand in the ongoing Budget session which begins today, employees of the IMC staged sit-in-protest at the gate of IMC office and banned the Mayor Municipal Commissioner and Asst Municipal Commissioner of the municipal corporation from entering the office. Speaking to media person Vice president of Imphal Municipal Employees’ Union N. Nimaichand said that the cease work strike begin since January 24, 2019 demanding to clear pending salary and arrears of 8 months which the government has already given the issued orders to clear it. He further said that the employees urged the concerned MAHUD minister and other officials to put up the issues of implementing the 6th pay commission and clearing of their salaries. But sadly the issues of the IMC failed to put up at the cabinet session happening today. Angered with the failing of putting up the issues of IMC, the employees not only staged sit-in-protest but also banned the mayor Commissioner and assistant Commissioner from entering the office. Placards ‘Go back Mayor’ ‘Go back Commissioner’ and ‘Go back Asst Commissioner were also pasted by the angered employees. A Myanmar woman, identified as Themneilam Haokip @ Neilam ( age about 35 years) daughter of Ngamsei Haokip , a resident of Namphalong Ward No 12 of Tamu District of Myanmar was rounded up by Moreh police along with huge quantity of brown sugar from near Sunrise Ground of Moreh Ward No. 4 of Tengnoupal district of India. As per source the woman was caught by police team consisted of women constable and supported by troops of 43 AR was smuggling 143 packets of Brown Sugar, weigh around 1.817 kg at around 6.25 am from inside the Indian Territory. The value of the narcotic substances she was carrying is worth around Rs. 3.63 crores in international market. Government promises for better health care facilities to all the people of the state turned another flop show in interior villages of the state as most Health care Service center of the government runs with flagstaff and inadequate infrastructures. Nungleiband Primary Health Sub Centre of Pinjang Village in Noney district, which was inaugurated in 2005 still stand more like a monument as it never open or provides health care facilities to anyone as no staffs or doctors attended a day after its inauguration. Chief Minister’s auspicious Health care scheme –CMHT is being mocked by the condition of the Nungleiband Primary Health Sub Centre. Pinjang, a village under Khoupum Sub division of Noney district having a population of about 400 peoples residing near the river bank of Leimatak River. 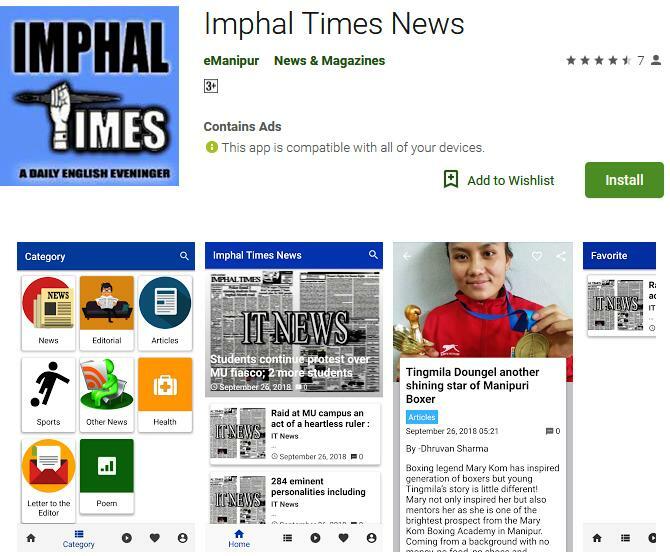 Even though the village is about only 60 kilometres from Imphal, it doesn’t even have mobile network facilities around the place in today’s era of information technology. The villagers went to Bishnupur which is 30 km from their village to check up even for basic health problems thereby facing a lot of hardships to the villagers. Even though the state government initiated various schemes and plans for the underprivileged and economically backward people of the state, the villagers of Pinjang still didn’t get any schemes of health, housing, sanitary or old aged etc. Such schemes are a dream for the poor villagers who need it the most. Though Chief Minister’s ‘Go to hills’ arrived at their place also, collecting various documents still no benefits from the government was there for them. And also now the government started to change its focus from ‘Go to village’ to ‘Go to school’, the only school which is a lower primary school of the area gives about 2/3 mid-day meal programs once a year which is a complete violation of norms of SSA. The teachers are also hired to make the school functional. The main occupation of the village is plantation of Banana and Chillies. Even though the amount of income gathered through the harvest of Banana plantation differs on being seasonal or not, but on an average a family gathers around only 50,000 rupees a year through it. Speaking to media person village authority Member Dominic Kamei said that the village has been lacking lot of facilities. He urged the government to make the health centre functional as the villagers face a lot of difficulties travelling up to Bishnupur even for minor problems. He also appealed the government to build a veterinary hospital as the livestock died a lot because of various problems and the villagers also felt helpless on it. Finally Dominic concluded that the villagers would be very obliged if the government could sponsor to organise a banana festival which will facilitate the economy of the farmers and also motivate them to plant even more as banana not only has many nutritious value but also interconnected with the people socially and ritually. The Indian Council of Agricultural Research-Central Inland Fisheries Research Institute (ICAR-CIFRI), Kolkata which developed the roadmap for inland open water fisheries for NE states for ushering in blue revolution, is collaborating with Manipur government for the self-sufficient in fish production by 2020. Manipur has vast fisheries resources comprising of 30,171 hectares(ha) of natural lake/floodplain wetlands,13,888 ha of rivers and streams,11,442 ha of ponds/tanks and many reservoirs which approximately 2.52 percent of the total geographical area of the state, according to ICAR-CIFRI. Despite having a production potential of 65,000 tonnes of fish, Manipur produces about 32,000 tonnes as against the requirement of 52,000 tonnes. This shortage is partly met by importing the fish from other states. The initiative of Manipur government is being taken considering the siphoning of a huge amount of money outside the State to purchase fish feeds every year and also to increase fish production. A State Level Committee had also already been formed under the initiative of chief minister N Biren to achieve self sufficiency in fish production by 2020. During the event, Principal Scientist Dr AK Das of ICAR-CIFRI, scientist Dr Sona Yengkokpam and Dr Dipesh Debnath also made a presentations on technologies interventions leading to visible changes in openwater fisheries, on pen and cage aquaculture in openwater of northeast India. The relentless operations by Assam Rifles, to rid the Manipuri youth of the devastating effects of drugs on not only the individual drug addict but also on the society at large, led today to seizure of a massive quantity of WIY Tablets at the bordering town of Kudenthabi in Tengnoupal District of Manipur. On Monday evening at around 1730 hours, based on specific inputs from their reliable sources, a team of Tengnoupal Battalion troops of Khudengthabi Post stopped a Dark maroon Coloured SUV TATA ARIA bearing registration No AS01AZ 1722. The vehicle was travelling from Moreh to Imphal. On carrying out a thorough check of the vehicle blue coloured pouches containing tablets suspected to be the highly addictive WIY tablets, were found hidden inside the doors and body of the vehicle. The contraband was being transported by a person named Angam Jonathan aged 36 years and Jhamtinsei Touthang aged 29 years. Angam Jonathan is resident of Maichammun Village, Churachandpur and Khamtinsei Touthang, son of Jamkhomang Touthang, is a resident of Zalenphai Part-III, Morehead Ward No.3, Tengnoupal Sub-Division, Chandel District. The WIY Tablets were in packed in 243 separate bricks covered with off whitish coloured paper, containing 10 packets each with each packet having a total of 200 tablets making it into a huge quantity of nearly five lakh tablets. The total 4,86,000 tablets counted till filing of this report is already worth approx Rs 14.58 crores estimated at the very conservative rate of Rs 300 per tablet. Over the years, IG Assam Rifles (South) has been making huge recoveries of drugs, gold and other contraband items along the Indo Myanmar border as well as from the valley region. Since January this year alone Assam Rifles South has been instrumental in recovery of contrabands worth more than 22 crores. Remaining true to their motto of being ‘Friends of the North East People’ Assam Rifles remains committed to making Manipur a drug free society. Indian women boxers collected a rich haul of 6 medals, including two gold, one Silver and three bronze medals to finish their campaign on a high at the 70th StrandjaMemorial Boxing tournament in Sofia, Bulgaria on Tuesday. Former world junior champion Nikhat Zareen(51kg) and Maisnam Meena Kumari Devi (54kg) grabbed the gold medals while debutante Manju Rani (48kg) had to settle for silver. The 22-year-old Zareen was absolutely ruthless in her bout against Magno Irish of the Philippines. With a flurry of punches, the two-time national champion never allowed her opponent to settle into the match and was declared a unanimous 5-0 winner. Nagaland’s Maisnam Meena Kumari collected the second gold medal of the day although the former Asian Championships bronze medallist was made to work hard for it. Aira Villegas of Philippines fought tooth and nail with the Indian in the 54kg final but Meena Kumari’s speed, alertness and resolve helped her pull through 3-2 in the tightly-contested match. India, however, met with disappointment in the 48kg category where Manju Rani went down 0-4 to former world champion Josie Gabuco of the Philippines. The latter’s experience proved too much for the young Manju to handle, who was making her debut on foreign soil. The 48kg Indian national champion initially lost 1-4 but a point was docked after she received a warning for accidentally punching the opponent even after the referee pronounced the end of the bout. This is a creditable show put up by Indian women pugilists in the first tournament of the European boxing calendar. Earlier, Indian women had delivered three bronze medals following the semi-final losses suffered by Neeraj (60kg), Lovlina Borgohain (69kg) and Pwilao Basumatary (64kg). With this, they emulated the performance by the Indian women’s team from last year when they finished with six medals as well. India could add yet another gold through the only Indian remaining in the men’s draw, Amit Panghal. The Asian Games gold medallist has his 49kg final bout scheduled later in the day.